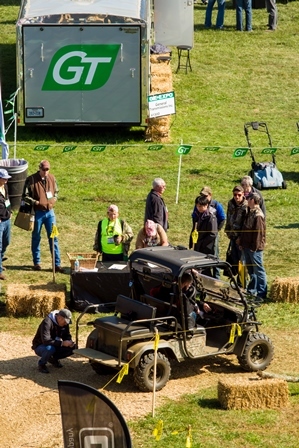 Attendees at the 2014 Green Industry & Equipment Expo (GIE+EXPO) 2014 will find a new emphasis on work utility vehicles in Louisville this October. Making the biggest splash, Polaris will return to GIE+EXPO for the second year to showcase their three lines of UTVs. In fact, the company has increased its outdoor space by more than 400 percent to make room for 16,000 square feet of demo track where attendees can test-drive utility vehicles from their BRUTUS, GEM and RANGER lines. Additionally, customers can put BRUTUS’ complete line of purpose-built, hydraulic and PTO attachments to the test for applications they execute every day like picking up, transporting and dumping 500 pounds of stones in the Materials Bucket and mowing large open lawns with a 66-inch wide Finishing Mower. One lucky winner will have the option to select a Polaris BRUTUS, GEM or RANGER Work UTV. Each attendee will receive an entry with their show badge. To enter, they must drop off the completed entry at the Polaris indoor booth (7212) by the end of the show, Oct. 24. GIE+EXPO dates are Oct. 23-24 for all industry participants with Oct. 22 designated as dealer day. The annual event is sponsored by the Outdoor Power Equipment Institute, Inc. (OPEI), Professional Grounds Management Society (PGMS) and Professional Landcare Network (PLANET). An early-bird registration discount is available through Sept. 11. For information and online registration for the tradeshow and education program,visit gie-expo.com.